The ground beneath our feet, our cars, our buildings, appears to be incredibly solid. But, rarely, that solid ground can simply open up without warning, dropping whatever was above into an unpredictably deep.hole. 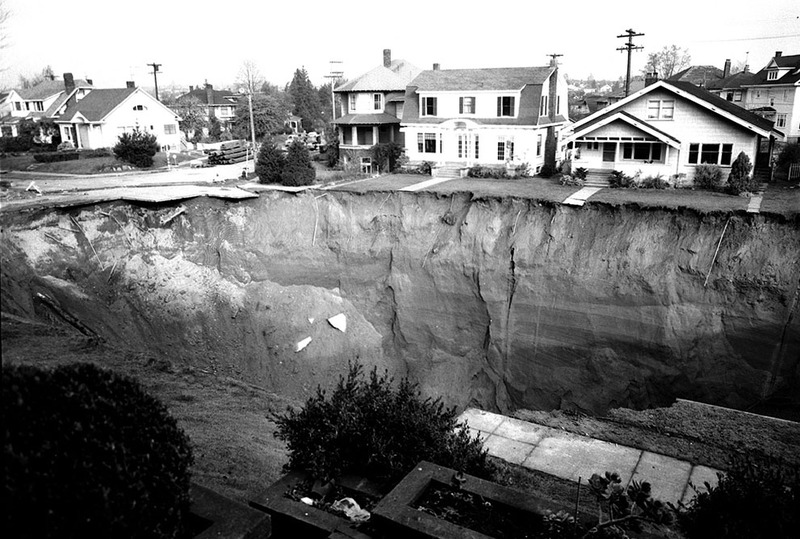 Sinkholes can be anywhere from a few feet wide and deep, to two thousand feet in diameter and depth. An undiscovered cavern or deep mine can collapse, allowing the ground above to crater, or a broken water main or heavy storm can erode a hole from below, until the surface becomes a thin shell that collapses at once. Communities built atop karst formations are very susceptible, where a layer of bedrock is water-soluble, like limestone, and natural processes can wear away caves and fissures, weakening support of the ground above. 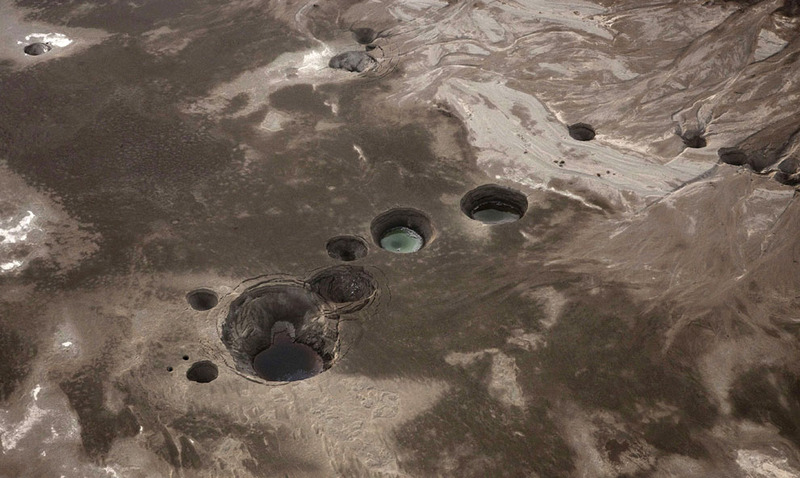 Gathered here are images of some of these sinkholes, both man-made and natural, around the world. 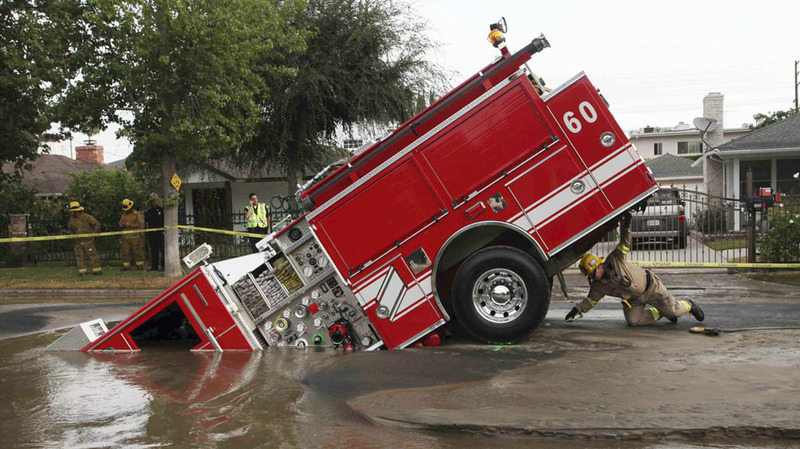 A Los Angeles fireman looks under a fire truck stuck in a sinkhole in the Valley Village neighborhood of Los Angeles, on September 8, 2009. Four firefighters escaped injury early Tuesday after their fire engine sunk into a large hole caused by a burst water main in the San Fernando Valley, authorities said. 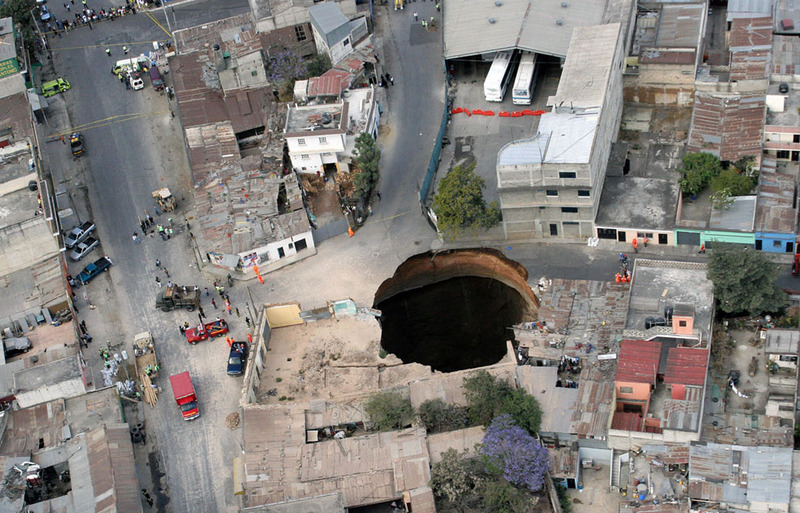 Aerial view of a huge hole caused after a collapse in the sewage system in the neighborhood of San Antonio, north of Guatemala city, on February 23, 2007. Three people were killed in the collapse, as twelve homes were swallowed up. 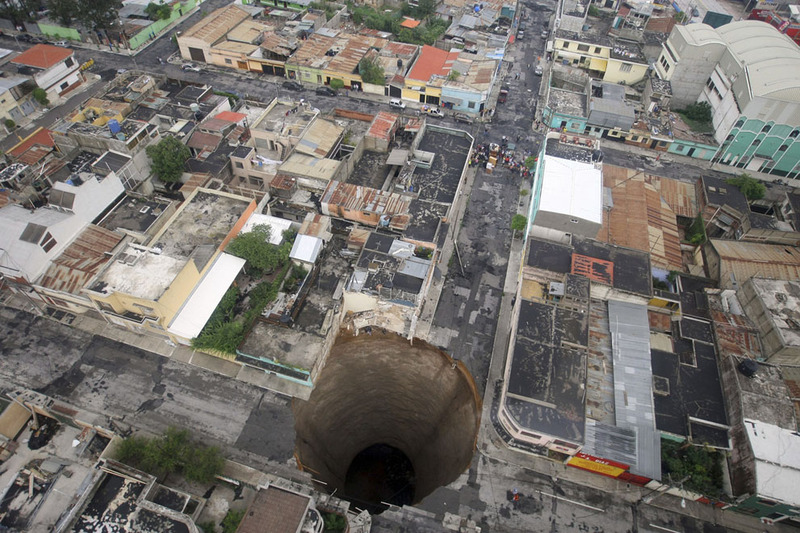 A giant sinkhole caused by the rains of tropical storm Agatha, in Guatemala City, on June 1, 2010. The hole swallowed at least one three-story building. A hole remains where a structure once stood in Guatemala City, on February 23, 2007. 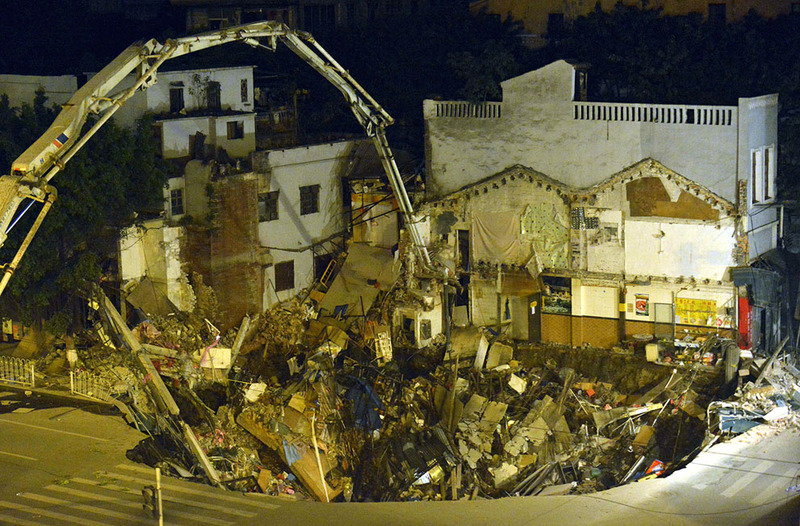 A giant sinkhole swallowed several homes killing at least three people, officials said. This aerial view shows a large sinkhole that claimed several sports cars, a house, and the deep end of the city swimming pool, in Winter Park, Florida, on May 11, 1981. 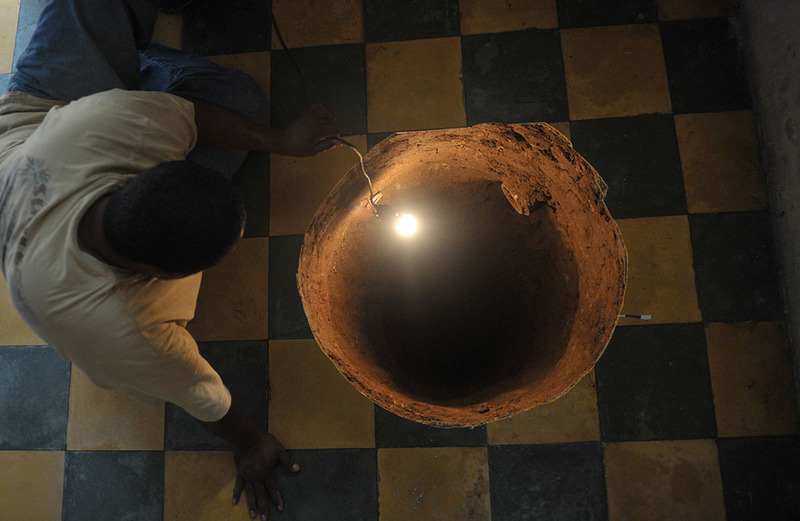 A man inspects a sinkhole formed in a house on July 19, 2011 in the north of Guatemala City. When neighbors heard a loud boom overnight they thought a gas canister had detonated. Instead they found a deep sinkhole inside a home in a neighborhood just north of Guatemala City. The sinkhole was 12.2 meters (40 feet) deep and 80 centimeters (32 inches) in diameter, an AFP journalist who visited the site reported. Guatemala City, built on volcanic deposits, is especially prone to sinkholes, often blamed on a leaky sewer system or on heavy rain. 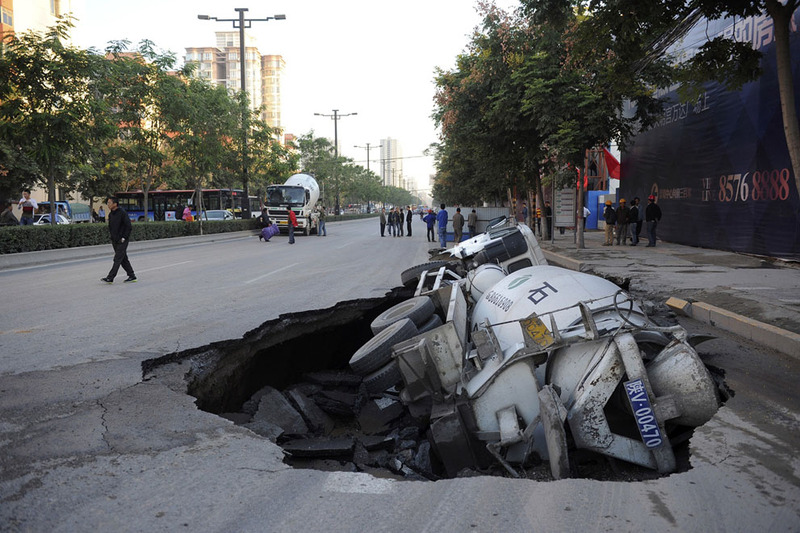 A truck lies in a sinkhole which occurred overnight on Shiliuzhuang road, in Beijing, on April 26, 2011. 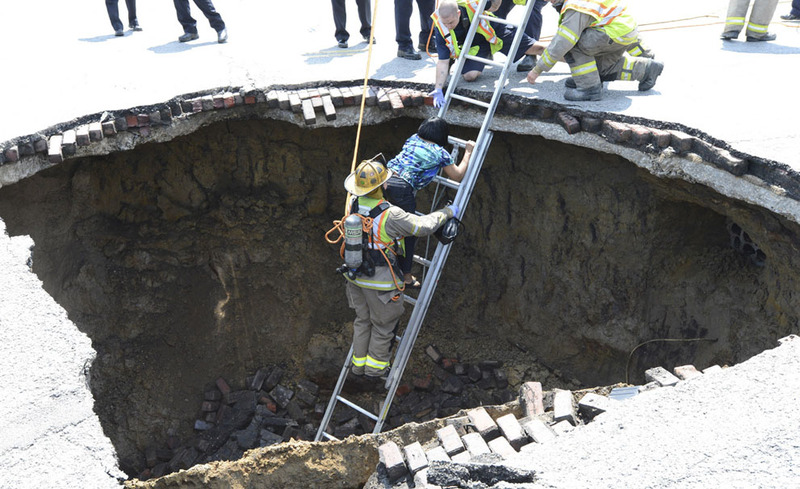 A section of the road collapsed beneath the truck, slightly injuring the driver and a passenger, who both jumped out the vehicle before it sank into the hole. 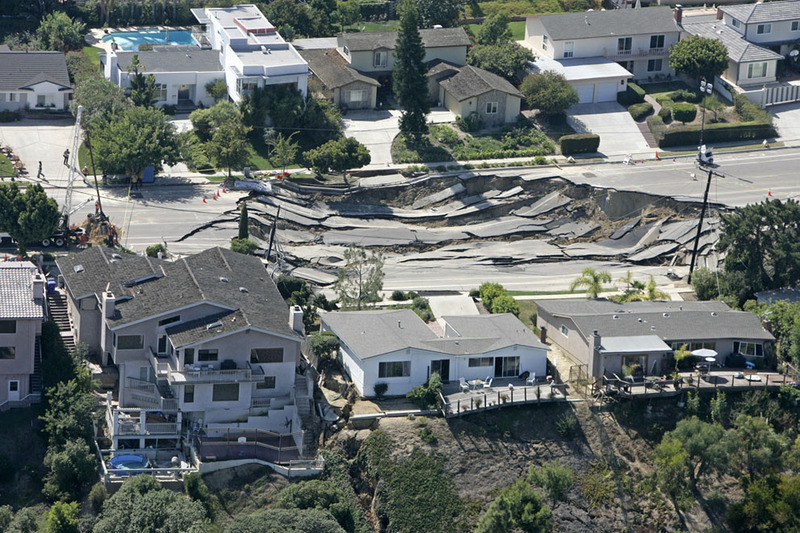 Three homes damaged from a sinkhole sit on the edge of a hill whose lower area collapsed onto other homes in the LaJolla section of San Diego, on October 4, 2007. 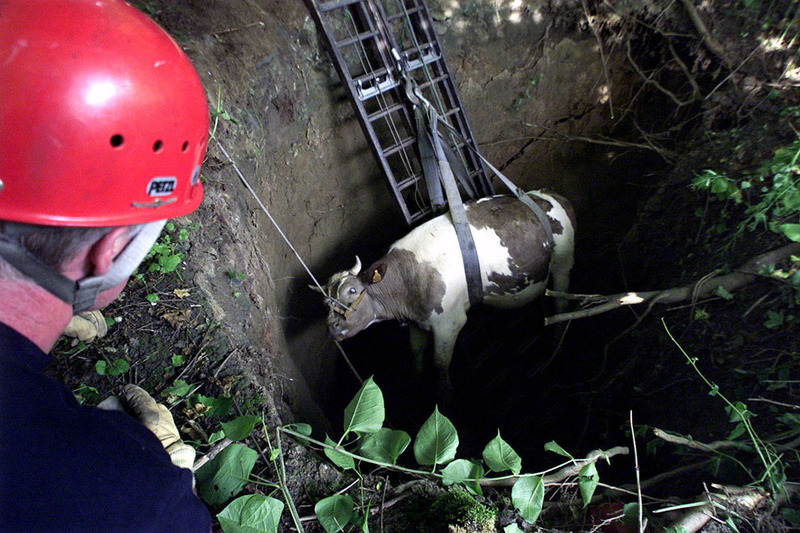 A fireman watches a cow being lifted out of a five meter deep hole at Saint Saulve near Valenciennes, northern France, on June 19, 2001. The ground collapsed as two cows crossed over an underground quarry. The cows were unhurt. 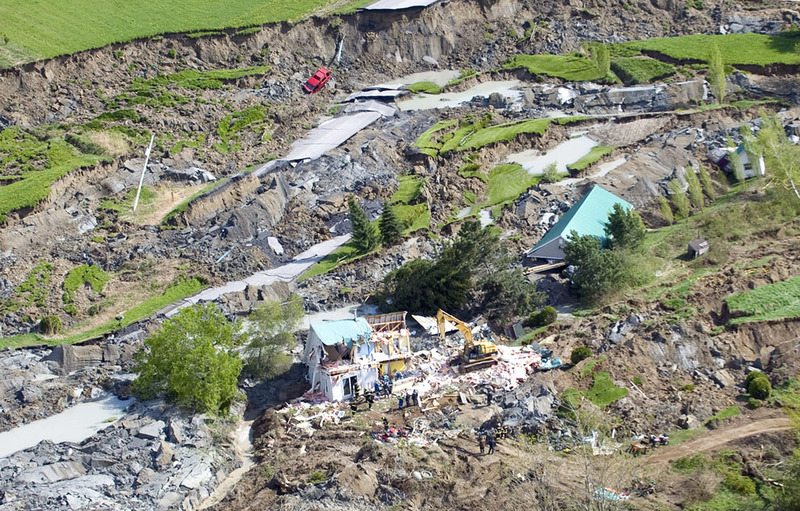 Rescuers work at the scene of a landslide in Saint-Jude, Quebec as shown from the air on Tuesday, May 11, 2010. Four people, including two children, are missing after a sinkhole triggered by a landslide swallowed their house northeast of Montreal. 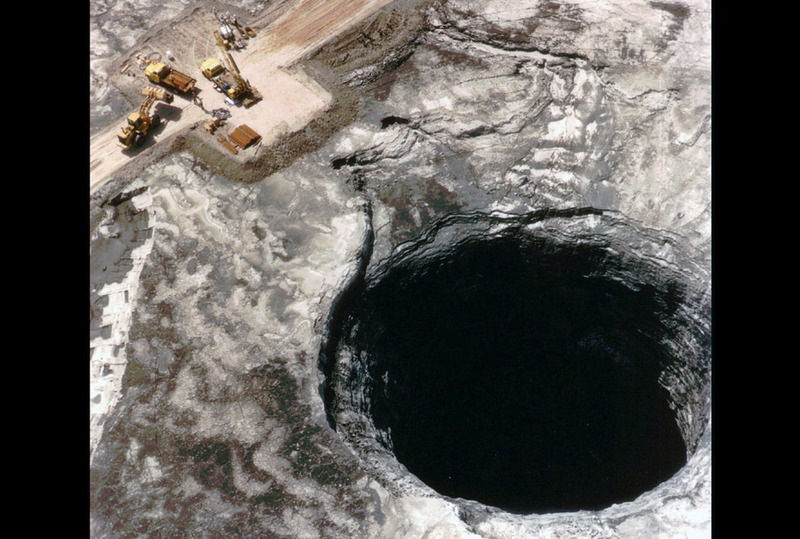 In June of 1994, a huge hole, 106 ft. wide by 185 ft. deep, opened in the center of an IMC-Agrico waste stack near Mulberry, Florida. 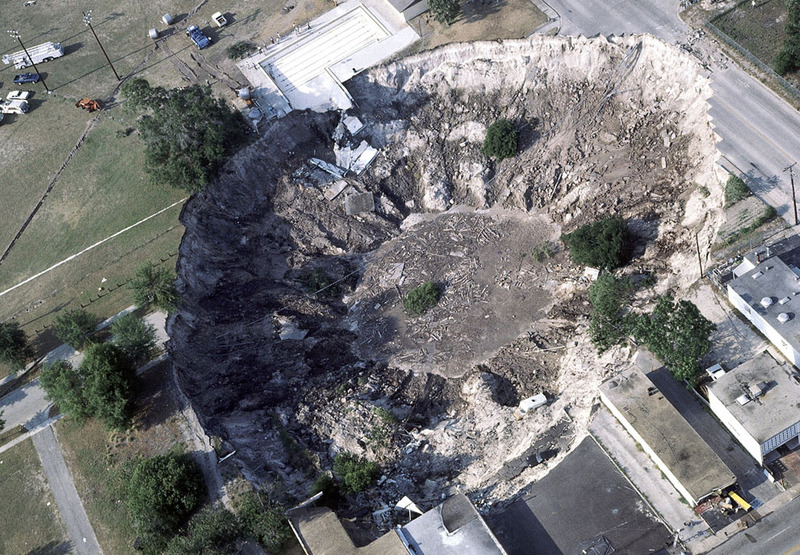 The sinkhole, shown in this July 13, 1994 photo, released 20.8 million pounds of liquid phosphoric acid into the ground below, and into the Floridan aquifer, which provides 90 percent of the state’s drinking water. The company voluntarily spent $6.8 million to plug the sinkhole and control the spread of contaminants in the ground water. 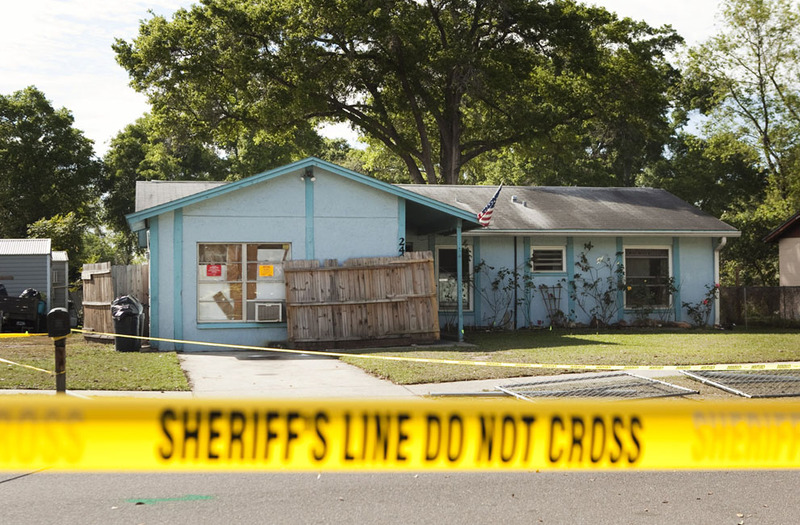 Police tape surrounds the house of Jeff Bush, who was consumed by a sinkhole while lying in his bed on the night of April 30, 2013 in Seffner, Florida. First responders were not able to reach Bush after he disappeared and were unable to even recover the body. The house and two neighboring houses were later demolished. An aerial view of sinkholes created by the drying of the Dead Sea, near Kibbutz Ein Gedi, Israel, on November 10, 2011. The Lassing mining disaster. 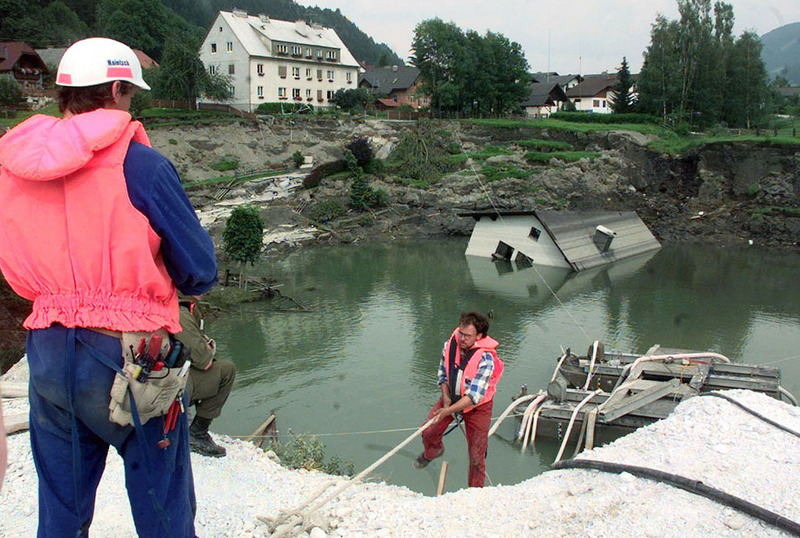 On July 17, 1998 a Talc mine below the town of Lassing, Austria, experienced a partial collapse, filling with groundwater and opening up a sinkhole in the town above. Shortly after, a rescue crew of 10 men went into the mine to search for a single missing miner, and a massive collapse followed, opening up an even larger crater above. The first missing miner was found alive after ten days, but all ten of the rescue team members were killed. Here, workers examine the crater, on July 22, 1998. 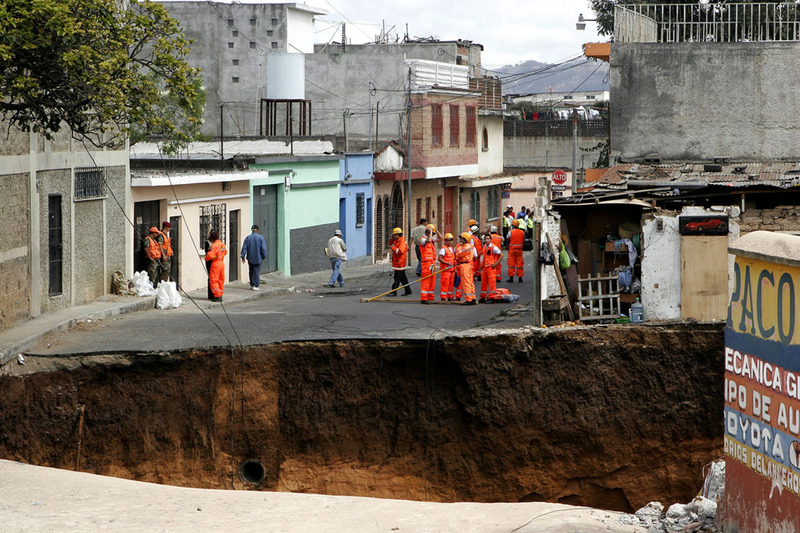 Neighbors gather near the site of a huge sinkhole in Guatemala City, on May 30, 2010. 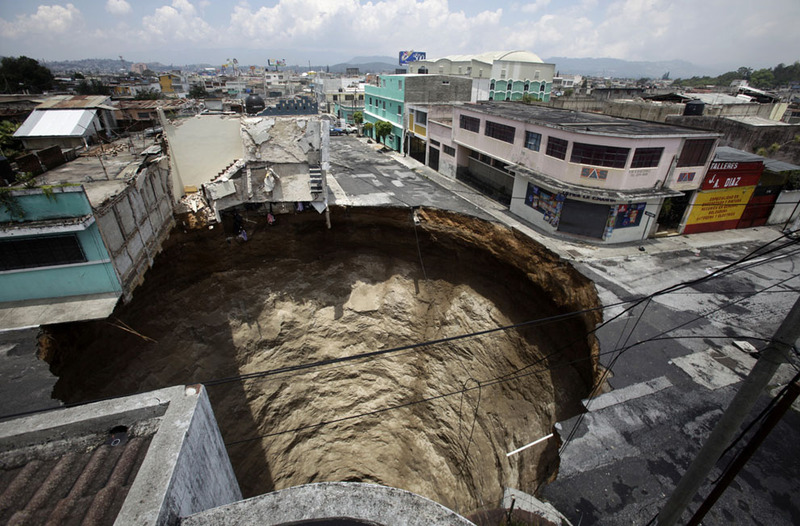 A giant sinkhole in Guatemala City, on May 31, 2010. 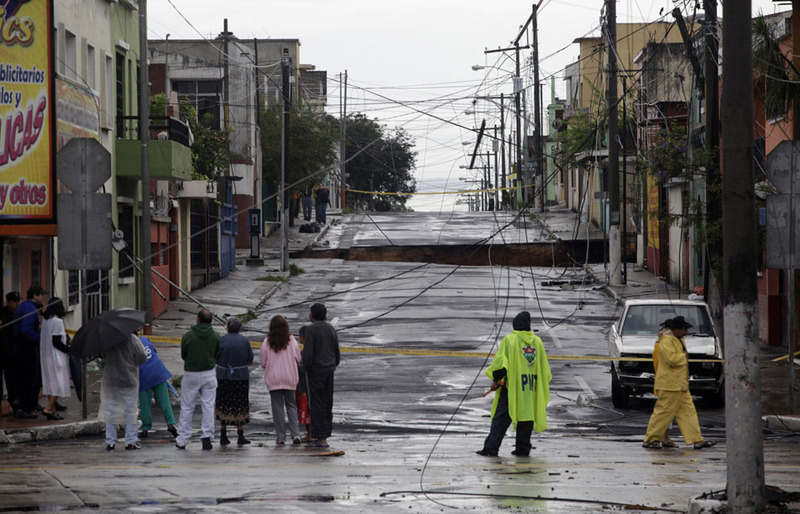 More than 94,000 were evacuated as the storm buried homes under mud, swept away a highway bridge near Guatemala City and opened up several sinkholes in the capital. 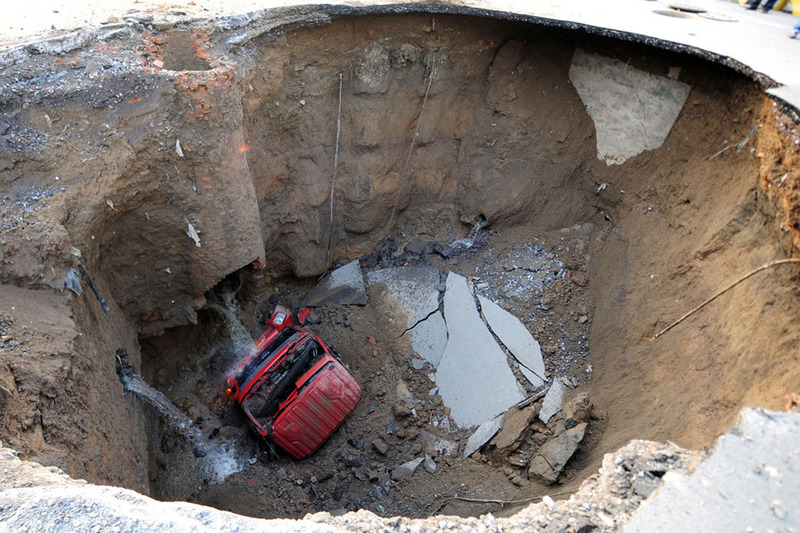 Workers use machinery to fill in a sinkhole that buildings collapsed into near a subway construction site in Guangzhou, Guangdong province, China, on January 28, 2013. 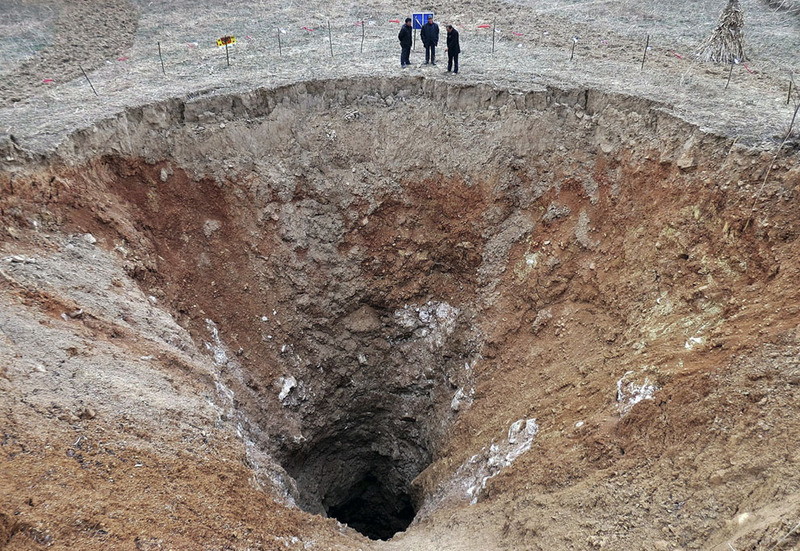 The hole measured about 1,000 square feet, and was around 30 feet deep, but no one was killed, according to a state media report. 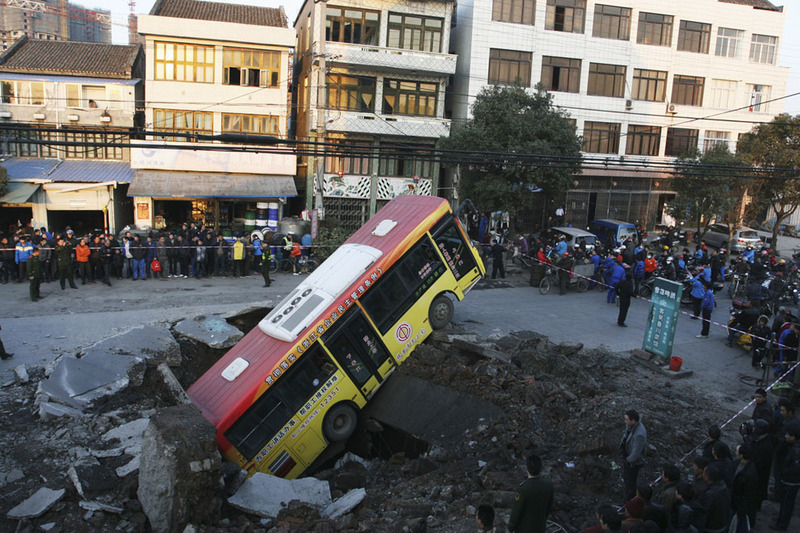 A bus, after falling into a pit created by an underground explosion in Rui’an, Zhejiang province, on January 16, 2011. An explosion on a road in east China’s Zhejiang Province tossed a bus without passengers four meters into the air, injuring the driver and a 6-year-old boy on the roadside, local fire fighters said on Sunday. The cause of the explosion was under investigation, Xinhua News Agency reported. 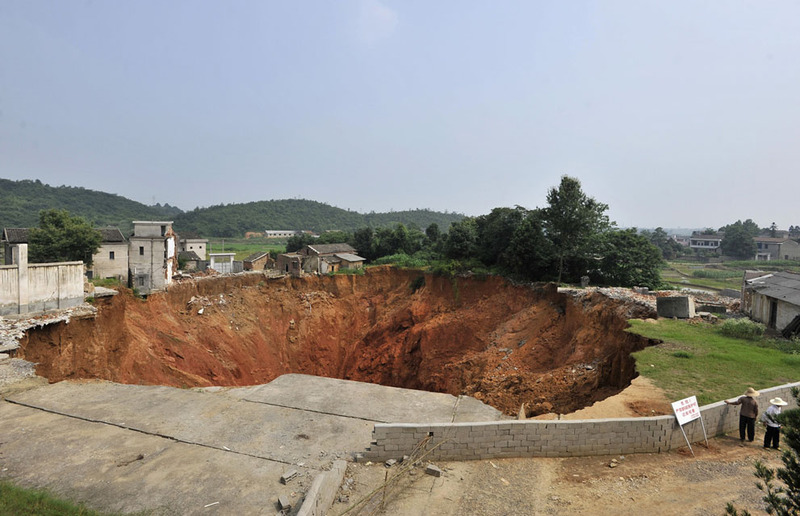 People stand next to a 24.9 meter (82 feet) diameter pit at a village in Guangyuan, Sichuan province, on February 28, 2013. According to local media the pit formed on a karst landform last year after the ground surface kept sinking for six days in September. The investigators said the pit may face further sinking after rains due to its geological conditions. 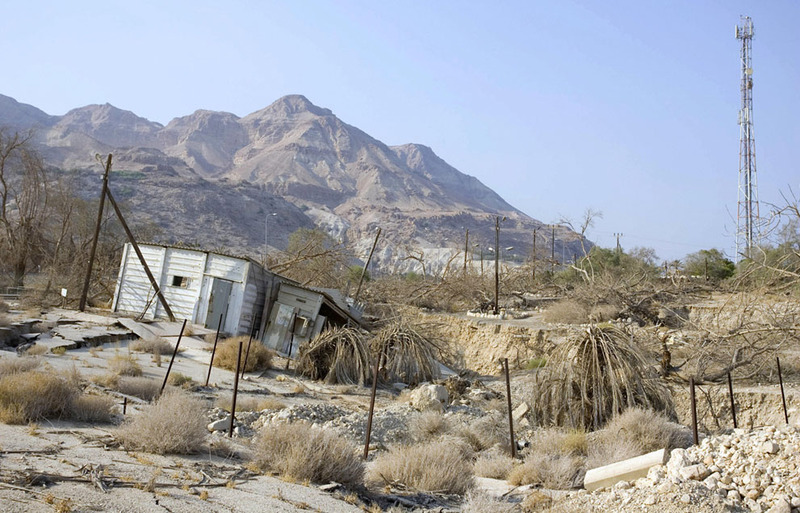 A campsite is sucked underground by the opening of cavernous sinkholes near the Ein Gedi Spa on the shores of the Dead Sea, on September 10, 2008. 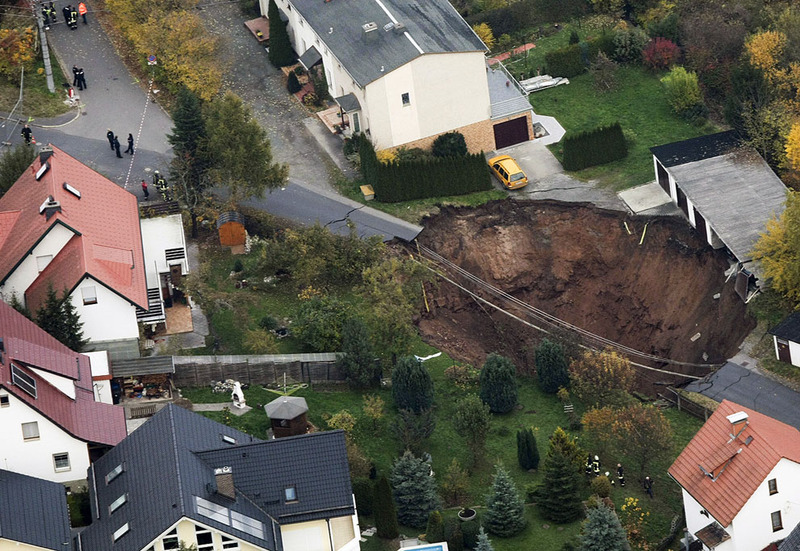 A large crater that appeared in the early hours in the German town of Schmalkalden, on November 1, 2010. A man walks past a cement truck which fell into a pit after the road caved in, in Xi’an, Shaanxi province, on September 28, 2012. 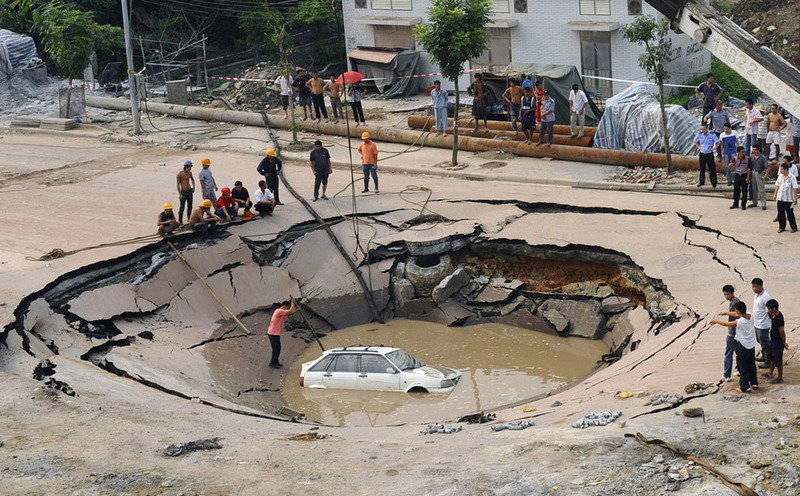 A stranded car is hoisted from a collapsed road surface in Guangzhou, Guangdong province, on September 7, 2008. 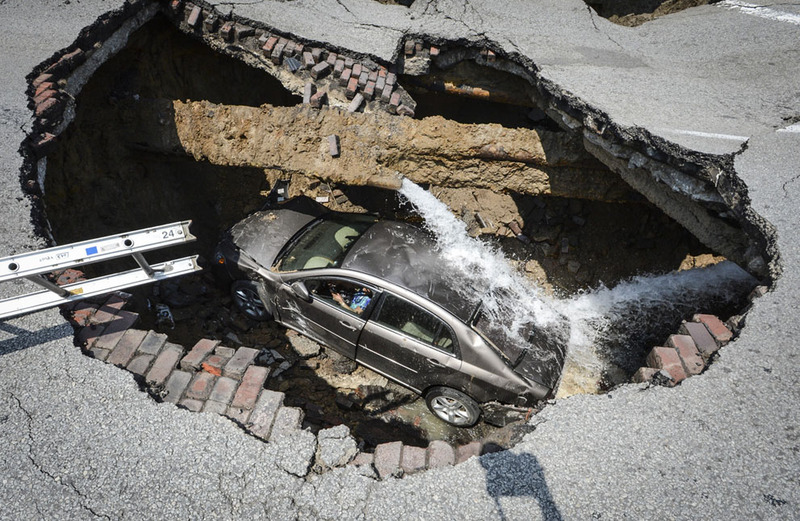 Local residents look at a sinkhole near Qingquan primary school in Dachegnqiao town of Ningxiang, Hunan province, on June 15, 2010. The hole, 150 meters (492 feet) wide and 50 meters (164 feet) deep, first appeared in January and has destroyed 20 houses so far. 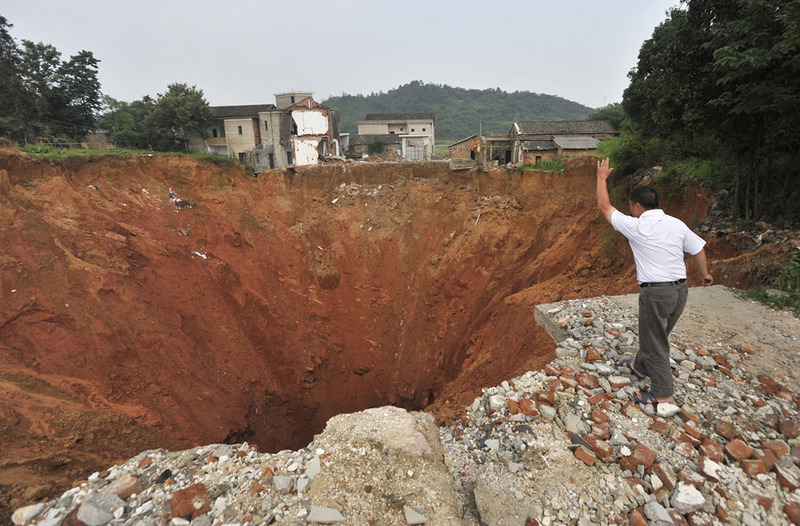 A local resident throws a stone into a sinkhole near Qingquan primary school in Dachegnqiao town, Hunan province, on June 15, 2010. No causalities had been reported and the reason for the appearance of the hole remains unclear.